This data has been surfaced through a bunch of clever stuff and we think it is immensely comprehensive. Some of it was playing catchup, but some is not available on any other link intelligence platfrom. It’s taken a lot of engineering work, but we’ve managed to bring you three brand new metrics to your backlinks pages (Backlinks, Lost and New). The screenshot above shows what you get. This example, from the backlink tab, shows a link to a page on one of my favourite sites, carandclassic.co.uk from a page on austinchamp.co.uk. (Yep – I am a sad old-timer.) But now we can see that the Austin-champ page has 8 links on the page… 1 of them goes to other pages on Austin-champ and 7 of them go to external websites. We also can see that they go to 7 SEPARATE websites, as we also report the number of external domains. This is an important new data point that we do not think any major link provider offers right now, because when you look at the link below – from what I would assume would also be a favourite site of mine if I spoke Dutch, we can see that this page has 195 links in all, going to 183 domains (182 + itself). It is not just that it has a lower Trust Flow and Citation Flow than the Austin-champ page, it is also that the link is more crowded out. Link metrics are calculated at the page level, not the domain level. The original PageRank algorithm didn’t care if a link was to another site or was internal… it was just a link. So if you had the only external link (to you) from a page, on another site, you probably thought that was a pretty cool link… but if you know there are 999 other internally focussed links on the page, you may wish to reevaluate what’s really happening. What’s important about all this is that clever SEOs can derive more meaningful insight of how valuable a link might be. In the original PageRank algorithm – and indeed in Majestic’s Flow Metrics – the more links there are on a source page, the less important the link to YOUR page is… so knowing how the linking page links out really helps to understand that dynamic. By dividing the link’s Trust Flow or Citation Flow by its outbound link count or External Domain count, you may be able to get a much better indication of link equity. SEOs will have to do some testing of their own to decide whether to use the total links, just the external links or the linked domains. I personally would start by using the sum of internal and external links to work out a dissipation factor, because I think this is what the PageRank algorithm would have used, although I have no inside knowledge about what Google does with multiple links on a page to and external site. My belief is that 2 links is nearly twice as good as one… to a point… when it comes to their algorithm. In any event, these new metrics give you much more data for you to make your own interpretation than you had before. Outbound metrics should really help you to find the high-value backlinks, and quickly identify potential directories and other undesired referrers. Majestic now shows the page titles of source URLs. This is invaluable to help you to quickly pick out the most important backlinks in your large set of results. This has been a much requested feature and sorry it took so long to get live! We had some legacy issues that needed to get sorted, but moving forward you’ll be seeing page titles almost everywhere, instead of JUST Urls. 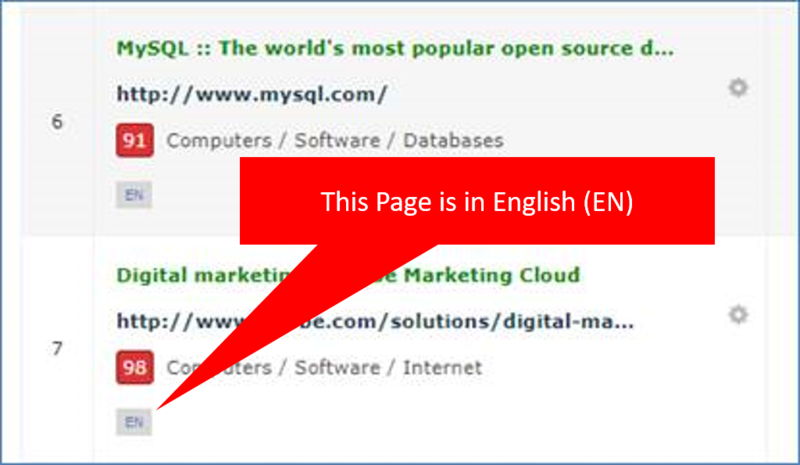 We can now detect the language of most pages that we crawl. This has proven quite a challenge, and one that we’re still working on to roll-out fully, but we’ve started to return our guess at the native language of a website. It’s not going to be available for all links from day-one, but we’ll get there – and we’ll start getting there in days, not months! I hope it’s pretty clear why knowing the language of a linking page is useful. For a start, if you are selling shoes in a shop in Missouri and all your links from pages written in Chinese or Italian, then something probably went very wrong with your SEO! This could indeed be a red flag if search engine like Google chooses to pay attention to this metric, but even if they do not use it as a spam signal, it would make sense for a search engine to use the dominant language of inbound links as a great indication as to which country index to put your site. If you are doing an audit and finding issues with your site showing up in the wrong countries, you might like to check your link profile! The most practical and positive use of this information, though, is in helping to establish whether a page linking to a competitor might be a good link candidate to approach. If the page is in Chinese… maybe not? One caveat here is that when we run our language detection alogirithm (yep – we have one of those… we tried Microsoft’s one, but it wasn’t very good!) we actually return a confidence level internally for the language that we think the site or page is in. If we run this from every single page, it might slow down out update frequency, so right now we are being a little conservative and you might find us adjusting things over the next couple of weeks while we get it right. If you find pages that we are getting wrong, we’d love to know via the feedback button. Our backlink page was getting pretty cramped, and it was difficult to scan down a list of links to find ones that were important, particularly where we reported on redirect chains. 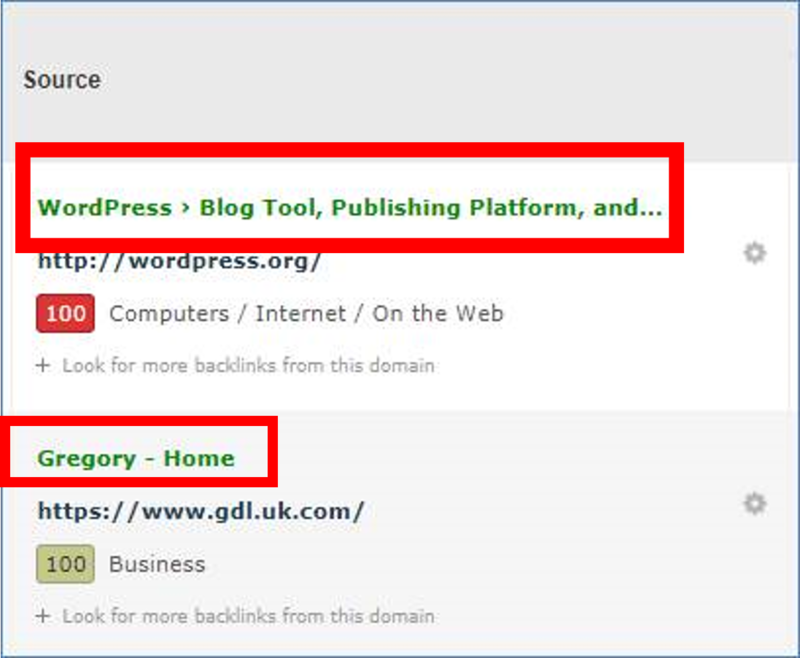 With this release, the source page and target URLs have moved to dedicated columns. The first few columns deal with the source URL, its metrics and number of backlinks, and the last two columns show the actual backlink, anchor text, link type, any flags, and important dates. It may take you a few goes to get used to the separation, but once you do, it really speeds up link monitoring and detection. Monitors are getting bigger…. We have moved the entire majestic.com website to a bigger page width, and that’s allowed us to add more data to your results. First up is Referring Domains. A few of you were annoyed that we contaminated the Referring Domain column by returning the title of the domain home page. You’ll be delighted to know that we have the space now to break those out into separate columns. Widening the page has opened up a big opportunity for us to show more of our big data in your results tables. We plan to sneak some of these out in the coming months (and pick up some outstanding niggles that widening the screen has introduced). For those very few in number users who still have 1024px wide monitors, we have tried to be as responsive as possible to bring the new data to you. Who gets all this new functionality? This is being rolled out live and in real time as our crawlers get to work. It is already very visible in the Fresh Index for pages re-crawled on after the 10th September, although the Historic Index will take a while to populate. We are surfacing this functionality in all subscriptions, so even Lite users can see this data right now. Seems like you guys have removed the link type column that showed whether the link was "do follow" or not. If I slipped this option may I please know where can I get the link type? Don’t worry, the information is all still there. We had to cram a lot of information into a small table, so we took the decision to split data about the source page (‘Source’ column) from data on the actual backlink itself. All of the items that used to appear under Link Type are now reported with the rest of the backlink’s <a> tag data (target, anchor text, link type) in the “Target (Anchor and Link)” column. Some interesting new data points! Will the outbound link metrics data be available via the API? Yes. Already in there, but not yet documented. So with this new external/internal metric, do you have a sense for a good ratio to be looking for? I recall looking for a Trust Flow/Citation Flow ratio to be .5 and above as a good indicator and just curious on your thoughts. Thanks James. The truth is… not yet… the data is now out there for all to see and do some analysis on, so I hope some bright spark will get to work and answer this for you. Howvere – my intuition says that it is going to very much be verticle specific. In some verticles, sitewides are approproate and common, whilst in others they are inapproproate and dengerous. I think it will not be a case of an "average". Love, love, love the ‘Dedicated Backlink Page Columns’…..makes digging into all this data a whole lot easier! In regards to metrics being unique to Majestic, semanticjuice offers that data as well, though on a smaller scale, and for specific topics defined by users. It shows not simply internal/external links and outbound domains but counts of, for the user’s topic, semantically relevant links. Thanks for sharing this useful post, I appreciate that. I like this new development, will try this new on my blog. Can i get this metrics data Via API? If yes, Then please contact me. I am dropping my blog address [edit: No you are not] if you need it. Thanks Majestic again for the new functionality.